The K2 Base Camp trek is made special by the epic scenery throughout our journey up the Baltoro Glacier, with more mountains coming into view the further we travel. The highlight of the trek is reaching Concordia which is the confluence of the mighty Baltoro and Godwin-Austen Glaciers. Also known as the “Throne Room of the Mountain Gods” one is rewarded with a stunning panoramic view which includes more than 40 peaks over 6,500m in height, four of which are over 8,000m. This 21-day journey which includes 21 days of trekking is suitable for experienced and adaptable trekkers with a strong sense of adventure. 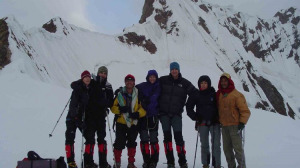 It is a camping trek which is fully supported by our team of friendly porters local to the Baltistan region.